Rock It! 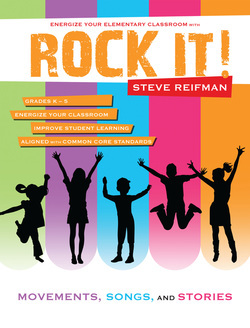 Transform Classroom Learning with Movement, Songs, and Stories by Steve Reifman is a groundbreaking book that shows teachers exactly how to make movement, songs, and stories part of their instructional methods every day. Math and English Language Arts activities are aligned with Common Core Standards to help teachers meet those requirements. Teachers know that students need to be active during the day. Their attention wanders when they are stuck in their seats too long. Rock It! shows teachers how to use more than 100 activities that include movement, music, and storytelling to instruct students. ​The activities in Rock It! help students learn concepts in math, English Language Arts, science, social studies, and health. Other activities use movement for warm-ups, as short breaks during the day, and as a way to build strong classroom bonding at the start of the year. Each activity in the book includes step-by-step instructions, including preparation, procedure, and variations. For grades kindergarten through five, activities can be easily adapted for the age group of the students. Research shows that children learn best when they have multiple ways to process information. Adding movement, songs, and stories from Rock It! to teach the curriculum will have students rocking to the beat of success!